I suppose there are other titles that could be used for the subject of this week’s Eye of Prophecy article. But since it follows on the heels of last week’s post entitled, Day of Infamy that dealt with the Jewish 9th day of Av—a date on which two titanic tragedies and other ominous events struck Israel—it’s appropriate to describe the recent nuclear arrangement with Iran in the same fashion. This deal with a nation that is an avowed enemy of Israel and the United States is eerily comparable to and just as menacing as the day that England’s Neville Chamberlain signed a pact with Hitler. An agreement that not only didn’t guarantee peace in their time, but actually intensified the winds of war that led to World War II. Deal? A very loose term at best. Agreement? I suppose so if they mean that the P5+1 nations agreed to everything Iran demanded. It just may be the most one-sided bargain of all time. No level playing field. No equal benefits for both sides. Picture a teeter-totter that won’t move up and down, with Iran grounded securely below and the P5+1 nations dangling in the air above … hung out to dry. Or a merry-go-round with Iran standing and smirking nearby as they watch the United States on the carousel going round and round at a maddening and dizzying pace. What makes it even more mocking is that the United States begged Iran to meet them on the playground in the first place. The imagery of a playground is suitable because the leaders of the United States and of other powerful nations on earth are playing with the lives and destiny of millions of Jews and Arabs and Persians in the Middle East. Oh, there was give and take. The United States and other P5 nations did all the giving and Iran did all the taking. In doing so, our Presidential Staff apathetically ignored the warnings of Israeli Prime Minister Benjamin Netanyahu in his stirring address to the United States Congress on March 3rd, 2015. Much was written about the speech that President Obama and Secretary of state John Kerry refused to attend, including the Eye of Prophecy article entitled, A Modern Day Esther, posted this past March 7th. Now that this infamous deal is done, it’s all too clear which path was taken. This deal has been in the making for nearly two years. Many of us hoped (wishful thinking) that the P5 +1 nations, which include the United States, would see through Iran’s deceitful agenda. That we would come to our collective senses, and fully realize that you cannot deal with a rogue nation—an enemy which before, during, and after the negotiations continued their tirade that calls for the humiliation and destruction of both Israel and the United States. Before we examine some of the threatening repercussions of this atrocious Joint Comprehensive Agreement, the most flagrant of which is an undeniable endangerment to the nation of Israel, I’d like to go back nearly 20 months to another Eye of Prophecy article entitled, Let’s Make a Deal, published 12-14-13, written about this deal in the early stages of negotiations. That column was as relevant today as when it was posted, and exposed the deplorable fallacy and imminent danger of what we can now label, A Deal with the Devil. That could also be the title of this article. Sometimes I will quote from prior Eye of Prophecy articles, but normally only a sentence or two or perhaps a few paragraphs. In this case, I believe it will be beneficial if we review a good portion of the Let’s Make A Deal post to fully grasp the ugly reality regarding the why, what, and wherefore of this terrible deal. We’ll then try to put these things into perspective pertaining to end-times prophecies and Biblical principles that provide warnings to nations that turn on Israel. In particular, we’ll take another (brief) look at the Gog/Magog invasion of Israel, of which Russia and Iran are the two main aggressors. Excerpts from Let’s Make A Deal, published December 14, 2013. (Note: All paragraphs from this prior article will be placed in italics. Any excerpts that were in italics from that article will be placed in bold print). About three weeks ago, Iran’s Supreme Leader Ayatollah Khamenei announced to the Iranian people: “Israel is doomed to failure and annihilation.” That, “Zionist leaders cannot be called human.” A short while before that, Khamenei said, “The Zionist regime is a rabid dog.” There were other words of hatred directed against Israel. But the irony of this menacing message is that it was delivered disrespectfully just a short time before the G5+1 (United States, Great Britain, France, Russia, China, and Germany) completed negotiations with Iran in a November 24th interim deal called a “Joint Plan of Action”—to ease economic sanctions against Iran in exchange for a “slow-down” of Iran’s nuclear enrichment of uranium. Would you make a deal with someone whose main purpose in life was to destroy you and members of your family or your best friend? How do you negotiate with those who would lie to you, cheat you, and ultimately kill you to accomplish their warped objectives? Where do you start? What do you say? How sure can you be? Why are you even there in the first place? But none of these questions seemed to bother the G5+1, with perhaps the exception of France. “Suppose, we can reason with them?” Really? Concerning Iran, if they had done just one positive thing in the last 34 years to suggest the slightest hint of cooperation or concession, then there might be a slim chance (say .01%) of reaching some sort of (mutual) agreement. It’s been 34 years since the attack on the US Embassy in Tehran and kidnapping of dozens of US Embassy representatives by the newly formed Islamic government of Iran. If we’re even a fraction wrong about Iran’s true intentions, then there’s a 99.9% chance they will follow through on their threats. Israel’s Prime Minister, Benjamin Netanyahu’s response to this menacing pact was to label it an, “historic mistake.” He should know. For the same 34 years, Israel has lived under the constant threat of Iranian terror exported to Syria and Lebanon, especially through Hezbollah. Because Israel understands her enemies far better than the United States under the current administration, Netanyahu also said, “The most dangerous regime in the world must not be allowed to have the most dangerous weapon in the world … we will not allow Iran to receive a military nuclear capability.” And, “As to the (Iranian) actual threat, we will act against it in time if need be.” These quotes are part of a speech given during Prime Minister Netanyahu’s recent visit to Rome. Note: Later in today’s article we’ll look at one of the unbelievable clauses in this nuclear agreement that very well could pit the United States and other nations directly against Israel, should Israel take action on its own against Iran. Regardless of your view on the right or wisdom of Israel to act independently of the US, or the G5+1, or the entire world, I would again ask: Would you sit down at the table with an enemy who has sworn to do anything and everything they can to terminate your existence on this earth? And keep in mind that Iran has not only threatened to wipe Israel from the global map, it has also avowed to destroy the “Great Satan.” That’s right. Iran refers to America as the Great Satan; Israel is only the “little Satan.” We should be so honored?! Fortunately, many members of the Senate and House of Representatives including some democrats have seen through the White House’s tactics, and have reminded Secretary Kerry and President Obama that the sole purpose of sanctions against Iran was to pressure them into absolute abandonment of their nuclear ambitions; not to entice this evil regime into diplomatic dialogue with a misguided hope that we could persuade Iran to listen to world opinion. We can only hope that the Senate and Congress exhibit the courage and tenacity to reinforce the sanctions. Why is this fortitude so vitally necessary? Because the evidence is all too clear: A nation like Iran doesn’t know the meaning of fair play. No more so than did Iraq’s Saddam Hussein. And how did we deal with Hussein? Well, we all know how that story ended. Did the United States negotiate with Hitler and his Third Reich, or with the Emperor of Japan, or with Mussolini? A thousand times, No! We fought to the bitter end … one that had no other possible option but unconditional surrender of our enemies. What makes us think that Iran is any different, when their blatant ambition to destroy Israel and America is no different that Hitler’s malignant plan of conquering Europe (and eventually the U.S.) and of eliminating all Jews from the face of the earth? *Note: At this juncture in the Let’s Make A Deal article, attention is shifted to another potential deal in the making at the time that article was written … negotiations between Israel and the Palestinian Authority for a Palestinian State within Israel. But even before the Palestinian Authority would agree to sit down at the bargaining table, Israel had to agree to release dozens of Palestinian prisoners, including murderers and terrorists; which Israel began to do, in three stages. As Israel expected, the Palestinians refused to begin negotiations. Thus, Israel halted the phased release of these prisoners, but only after dozens had been freed. I’m sorry; as much as I love my country and want to respect and support a President (just because he is our President, but whose actions and programs seem to undermine the very nation he leads), I must issue a challenge: Would the United States agree to liberate hundreds of the worst criminals from their jails just to get “peace talks” underway? I think not. But then, the United States didn’t need to make such an unfathomable concession. Instead, we asked Israel to do something this country wouldn’t think of doing: comply with the PLO’s incomprehensible and reprehensible demand to release their terrorist sons and daughters back to them. Admitting that Israel has a right to exist as a sovereign nation is the bedrock foundation before any compromises whatsoever are considered. Incredibly, Israel is willing to make who knows what concessions just to be recognized as a people and as a nation. Can you imagine any President, including the current administration, needing to seek recognition as a nation before the United States would enter into negotiations or sign a treaty or pact? President Ronald Reagan comes to mind: He couldn’t have cared less whether Mikhail Gorbachev’s Russia didn’t like America or if the Soviet Union had refused to (symbolically or literally) accept the very existence of this great nation. But the Israelis have been compelled to guard their security and very survival with an opening statement that would be unthinkable for any other nation on earth: We’ll give you some of what you demand, but first you must consent to the existence of Israel. Unless the Palestinians make some sort of declaration that (at least in principle) acknowledges the geographic, national, political, cultural, and racial existence of the Jews, then all of the other points of negotiation are essentially meaningless. Such issues as: return of Arab refugees, control of Jerusalem, Jewish settlements in the West Bank (Judea and Samaria), control of the border crossings especially between Jordan and the West Bank, return of the Golan Heights to Syria, and the actual geographical boundaries of a Palestinian State. When in July, 2000 at the Camp David Summit arranged by President Clinton, PLO Chairman Yasser Arafat rejected an astonishing offer by then Prime Minister, Ehud Barak … to assume control of up to 92% of the West Bank, all of the Gaza Strip, and all of East Jerusalem except for the Western Wall—that said it all. The Palestinian Arabs are not interested in “sharing” the land. They never have and probably never will. They want it ALL. They want Jews out. Why a whole bunch of people world-wide, including some Christians, fail to grasp this is beyond me. So Israel mulls over a practically hopeless situation: how to work reasonably with those who demonstrate virtually nothing but irrational hatred and hostile behavior toward you? The Jews rightfully ask: How can you make a deal with someone who doesn’t even recognize that you exist? When they look at you, you are, for all practical purposes, invisible. You are a nonentity. You don’t have a birthright (right of birth) and you aren’t even qualified to belong on the map. You don’t belong here or anywhere, because your rebirth (1948) was entirely illegitimate. Never before in history has the entire world been so focused on one little nation inhabited by a mere six million Jews. And yet that’s exactly what the Bible predicted. 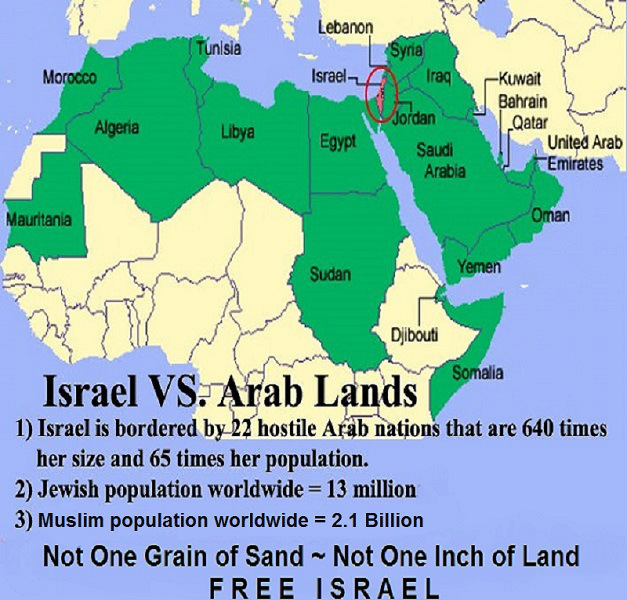 In addition to several million Arabs in Israel, surrounding Arab countries number in the hundreds of millions, with land space that dwarfs Israel; enough land to accommodate millions more Arabs. But oddly and unfortunately many of these nations fight among themselves (Egypt, Libya, Tunisia, Yemen, Iraq, Syria, and Lebanon). Even more nonsensically, they blame the Jews for their misfortunes. However, they do have one basic mindset: They detest Israel. I suppose if they ever agree on how best to govern themselves (Sunni or Shi’ite Muslim law), then they might (God forbid) agree on how to best destroy Israel. Or perhaps they think and hope that Iran will do that for them. Personally, I don’t dislike the Arabs or the Persians. I sometimes pray for their salvation, as I often do for the Jews. I will do my best to pray equally for both peoples. But the aforementioned observations are a matter of historical record and current events. Presidents, Prime Ministers, Kings, Queens, Heads of State the world over are under the influence of the “intoxicating” effect that Israel has exerted on the entire world. (Read Zechariah 12:2-3). Nations are stoned from an overpowering elixir to find a solution to the problems in and surrounding this tiny country. To their detriment, many of these nations point the finger of blame at Israel; but seem to do so in a senseless, illogical drunken stupor caused by consumption of too many “spirits” from Arab, Muslim, Russian, South American, and European winepresses. And, I’m beginning to be concerned about America’s sudden taste for this wine that can only lead to the pouring out of God’s wrath through His winepress (Revelation 14:19). There is, however, a dreadful risk for every person on earth who rejects Messiah Jesus as personal Savior and every nation that refuses to accept the very existence of and purpose for Israel, as clearly set forth in Scripture. Personal Rejection of Messiah: “And anyone who believes in God’s Son has eternal life. Anyone who doesn’t obey the Son will never experience eternal life but remains under God’s angry judgment” (John 3:36). National Rejection of Israel: “The day is near when I, the LORD, will judge all godless nations! As you have done to Israel, so it will be done to you. All your evil deeds will fall back on your own heads. Just as you swallowed up my people on my holy mountain, so you and the surrounding nations will swallow the punishment I pour out on you. Yes, all you nations will drink and stagger and disappear from history” (Obadiah 1:15-16). Undoubtedly, many reading this article have read or heard the component parts of this infamous deal with Iran. Thus, I’ll simply summarize the main points. Beginning with four primary problems identified by Israeli Ambassador to the United States, Ron Dermer, as condensed in an article written by Max Gelber, posted 7-16-15 on the United with Israel website, who extracted some of his material from a Washington Post column published the same day. 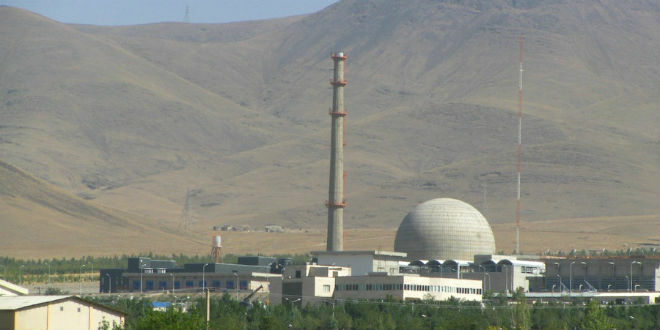 First, the agreement allows Iran to maintain virtually its entire nuclear plant/facility infrastructure. Second, the limitations imposed on Iran’s nuclear projects are merely temporary, with the most binding restrictions lasting only ten years. Third, other nations in the Middle East fully comprehend that this agreement still paves the way to a nuclear-armed Iran, and will accordingly join the race to buy or manufacture nuclear weapons of their own. (Saudi Arabia and Turkey come to mind). Fourth, to the tune of some $150 billion dollars, Iran’s assets will be unfrozen and the money released to Iran’s banks. Economic sanctions will be phased out. With no secret whatsoever, that these funds will be used to resume (to a much larger extent) Iran’s subsidization of its terrorist affiliates like Hezbollah and Hamas. As well as acceleration of subversive activities in Iraq, Syria, and Yemen. Next is a summary of other negatives for Israel and the P5 +1 nations and positives for Iran, referenced by Max Gelber in his article. First and foremost, the deal does not halt Iran’s nuclear programs, as it allows Iran to (more slowly, but nevertheless continually) enrich uranium far beyond its civilian needs. Which means the only other use for all this surplus uranium or plutonium is unmistakably military. The agreement doesn’t come close to sufficiently curtail Iran’s nuclear research and development capabilities, certainly not enough to delay the time needed to manufacture a nuclear bomb to the point where preemptive action could be taken. The agreement severely cripples embargoes and sanctions previously imposed by the United Nations Security Council to restrict Iran’s development of intercontinental ballistic missiles. Monitoring of Iran’s compliance is virtually a sham. The 24-day warning of an impending inspection would allow Iran more than enough time to hide, cheat, and lie about what they’re actually doing. All of which they’ve done repeatedly in the past. But the most unthinkable feature of this disastrous deal is a tiny clause in the agreement that nations signatory to the pact will defend Iran against any subterfuge that might interrupt or shut down Iran’s nuclear facilities. Ostensibly this was designed to enable Iran to continue with its purported program of commercial nuclear developments for peaceful civilian purposes only. Right? No, it’s as wrong as anything can be. What the stipulation actually does is to obligate the United States and other involved countries to intervene no matter if a nation (Israel, who else?) attempts to sabotage Iran’s nuclear substructure—whether through a military strike or cyber-attack—for the much more truthful reason of preventing this reprobate nation from developing nuclear weapons. It’s simply inconceivable and mind-boggling that the United States would agree in any way, shape, or form to actually come to the aid of an enemy who continually chants, “Death to Israel. Death to America.” It is pure lunacy. And immoral madness at that. Immoral, because it’s no different than, for example, the United States making a deal with Hitler during World War II in which Germany would agree to stop the production of self-propelled rockets (for say, 3 years) but they could continue to carry on the war as they saw fit. 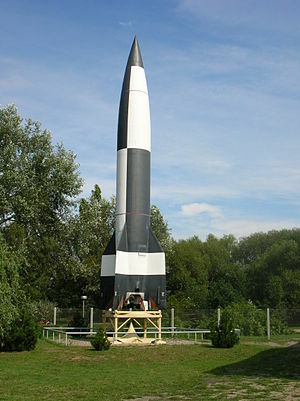 Moreover, we would actually defend Germany’s war making facilities for all other hardware, just not rockets. Knowing full well that it’s the same machinery that manufactures all of the armaments. Moreover, this absurd deal took place after it was clear that Germany was losing the war. (Just like it is unquestionably evident that the heavy economic sanctions against Iran were taking their toll). No matter how extreme or far-fetched you think this analogy might be, ask yourself just how radical this deal with Iran is. You only need look at the totally one-sided concessions made by the P5 + 1 to see that Iran comes out smelling like a rose (a rose-tipped nuclear warhead). It give a whole new meaning to: We’ve got you … just where you want us. At first glance and at face value, this ill-conceived, misguided, and grossly imbalanced “deal” indeed places Israel in grave peril. From public reaction, especially in the United States, it’s evident that the majority of people realize that Israel gets the short end of the stick. They comprehend the all too obvious fact that Iran cannot be trusted, AT ALL. And they rightfully challenge the authority of the US government to make a deal that puts Israel directly in the scope of Iran’s nuclear trigger point. 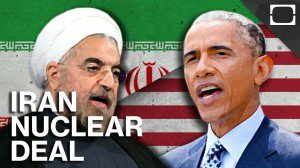 In fact, a very recent poll disclosed that over 50% of Americans believe that Congress should annul the deal with Iran, which would subsequently require a 2/3 majority of Congress to override what would be a certain veto by President Obama. If Congress listens to us, they should overturn this dastardly deal. Though (justifiably) sarcastic, Netanyahu’s response says it all. Yet, here is where a better grasp of Biblical prophecy helps us put contemporary developments like this into a much clearer context. To that end, I’m going to refer again to the Gog/Magog invasion of Israel as predicted through God’s prophet, Ezekiel. Several prior Eye of Prophecy articles have been written, partially or completely on this astounding attack on Israel in which a coalition spearheaded by Russia (to include Iran) is soundly crushed by God, himself … via direct divine intervention. Please refer to such articles as, The Omega Generation, published 2-15-14; Beware of the Bear, published 3-22-14; Alliances against Israel, published 9-20-14. But for purposes of today’s topic, most specifically to, Russia & Iran Versus Israel, published 10-4-14. When correlated to other prophecies in Scripture, all of the evidence found in Ezekiel Chapters 38 & 39 leads to the viable conclusion that this invasion will take place soon after the Rapture, during the first part of the Great Tribulation. Furthermore, it will entail a vast “horde” (armies) that swoops down on Israel from the north. The undeniable conclusion is that this is a massive but conventional assault against Israel that does not include nuclear weapons. For one thing, Israel is completely victorious in this military campaign against her, but not through Israel’s effort. Nor is there any indication that Israel suffers even minimal casualties. In fact, it is God who will employ “weapons of mass destruction” against Gog/Magog … meaning supernaturally orchestrated natural disasters inflicted on the invading troops. The applicable inference and significance of what is happening in this Gog/Magog invasion is that there will be no nuclear war between Iran and Israel before this Biblically prophetic attack occurs against Israel. There couldn’t possibly be, because just one nuclear warhead detonated over the tiny State of Israel would cause devastating damage of staggering proportions. I’m not saying that Israel won’t launch a preemptive strike against Iran prior to the Great Tribulation, but an all-out war between Iran and Israel won’t take place until the Gog/Magog invasion. If it did, there wouldn’t be any need for Russia, Iran, and their allies to invade Israel; as Israel would have already been brought to her knees, if not virtually eliminated from the face of the earth. And, I can say with absolute Biblical certainty, THAT AIN’T GOING TO HAPPEN! Israel is here to stay; now and forever more. We can take that to the bank, deposit it, and watch the interest (blessings to the rest of the world) grow with leaps and bounds. For Americans, the real concern of this deal that will live in infamy is or should be the very idea that the United States would seemingly take on God, himself. To ignore, dismiss, deny, and even reject God’s ultimate warning concerning international treatment of Israel. God will take to task those individuals and nations who blatantly snub, endanger, hold in contempt, or harm Israel in any way. The verse has often been quoted, but The Lord’s warning to those who seek to disparage Israel bears repeating: “I will bless those who bless you and curse those who treat you with contempt. All the families on earth will be blessed through you” (Genesis 12:3). “At the time of those events, says, the Lord, when I restore the prosperity of Judah and Jerusalem (which is happening before our very eyes today), I will gather the armies of the world into the valley of Jehoshaphat. There I will judge them for harming my people, my special possession, and for dividing up my land” (Joel 3:1-2). “It is a terrifying thing to fall into the hands of the living God” (Hebrews 10:31, NASB).